Photo credit: Rick Obst (cropped), CC BY 2.0. About three months ago, I met my girlfriend M on Tinder. Our first date was at a neighborhood bar with a great patio, on a Sunday afternoon. I was expecting to get a drink or two each, and if things went well, maybe take a walk to the nearby park afterward. I had recently moved to Portland, Oregon for work, and I was in the process of getting my new driver’s license from the DMV. It had somehow escaped me that my old license was expired, which meant the bartender wouldn’t serve me, and told me I would have to leave. I hadn’t been on a first date in over four years, and I had never been kicked out of a bar before. I was mortified. Thankfully, M was super kind and flexible. She left her mostly-full beer on the table and we decided to walk around the neighborhood instead. This led to a great conversation about homeownership fantasies (and they will stay fantasies in the Portland real estate market). We ended up at a bizarre, semi-public space called the Dog Bowl that overlooks the shipyards on the Willamette River. It ended up being a lot more fun than the standard first date at a bar! On our second date we both confessed that we have detailed monthly budget spreadsheets where we track every expense. We are both young, early-career professionals with five-figure student loan debt. It’s such a relief to me to share this with someone, because I’ve never dated anyone who shares my desire to track and reduce expenses. I’ve definitely spent more money in the last few months than when I was single. Being in a new relationship has a way of pushing me to want to experience everything I can with my partner. So far, though, our most memorable experiences together have been some of the lower-cost ones. Buying a $6 kiddie pool from Fred Meyer and rolling it home on a 100-degree day was much more memorable than buying a mediocre $15 wrap from a super-hyped restaurant. M and I don’t typically see each other on weeknights, since I have a long commute to work (technically I’m a super-commuter). We like to lay low in town on Saturdays and work on creative projects or spend time with friends. On Sundays, we usually go on day trips. Living in the Pacific Northwest makes this easy — we can drive an hour outside of town in any direction and hit something great. Lately, it’s been so hot that we’ve been going to public swimming holes every Sunday. To keep my budget on track, I try to minimize my spending as much as possible during my work week. I pack lunch every day, and make cold-brew coffee overnight in my fridge to avoid coffee-shop temptation in the morning. I do eat more frozen meals than I’d like, but by the time I get home at 7 p.m. I rarely feel up to meal prep. Concentrating my expenses on the weekends helps me balance my fun goals with my financial goals. Plus, a nice meal out with M on the weekend is much more gratifying to me than a lunch combo at Subway during the week. $10.75 for my ticket to see Mamma Mia 2 at a movie theater just outside of Portland. M and I met up with a couple of her friends to see Cher sing Fernando. Worth every penny. $6.40 for a small popcorn that I shared with M.
$3.79 for a slice of food court pizza, because half of a small popcorn isn’t exactly filling. $15.00 at Satchel. This is typically a once-a-month expense for me, and depending on what I buy, runs me between $10 and $15. $50.00 at my favorite pizza place in Portland, Dove Vivi, on Friday night. $50 paid for three drinks, a cornbread crust pizza that fed M and me for two meals, and a tip for our great server. $9.00 for a breakfast sandwich and iced coffee on Saturday morning. $12.19 for groceries at Fred Meyer. This bought a box of Arm & Hammer cat litter, an 8-pack of passionfruit LaCroix, a bunch of cilantro, and a large plantain. M and I used the cilantro and plantain to cook our dinner, which was brown rice, spiced black beans, and fried plantains and frozen vegan tamales. $0 to hang out in M’s backyard with our feet in her kiddie pool. 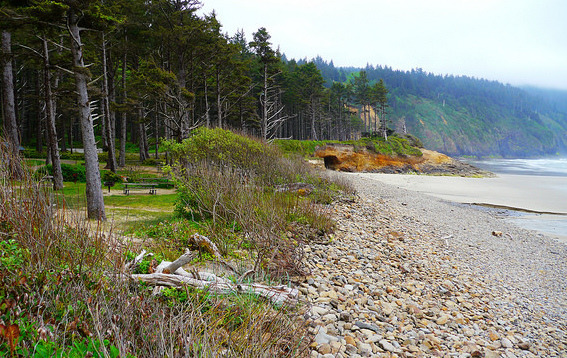 $0 to drive out to the Oregon coast and look for mushrooms on Sunday. (We alternate who drives every time we go on a day trip, and M drove last weekend.) M is in a foraging group on Facebook and people have been finding lobster mushrooms near the coast lately. We didn’t find any but we did spot a lot of non-edible mushrooms, and we hung out at a nearby public beach. $11.00 for a beer, slice of pizza and tip at a pizza place on the coast. As it turns out, pizza spending is a startlingly significant portion of my monthly budget. We are currently planning our first non-camping trip together, to Los Angeles in November. We will be using airline miles for our tickets, and staying with one of M’s close friends. We both prefer taking public transit over driving, so we are planning on using public transit for most trips in LA. Most of our must-see spots are free (Santa Monica public beach, La Brea tar pits, the Getty, Griffith Park) so I’m anticipating that our major expense will be food spending, which isn’t a big change from home. Any tips on how to enjoy Los Angeles on a tight budget would be much appreciated! Lee Cullums is a local government employee in the Pacific Northwest. She recently started blogging at The Peckish Planner about balancing her love of food and her budget.